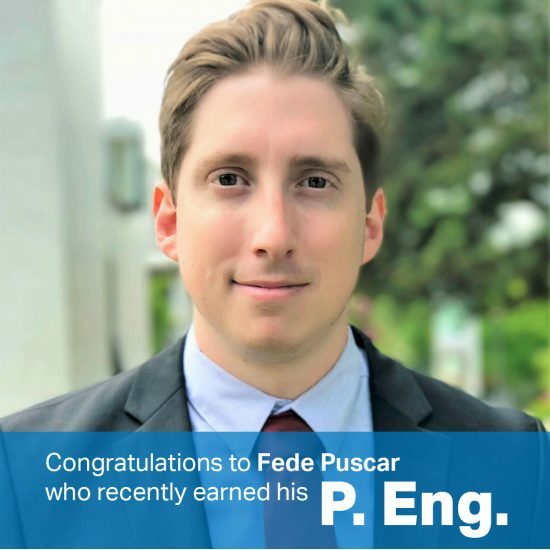 Congratulations to Fede Puscar who recently earned his P. Eng. status and who is now licensed as a Professional Engineer Licensee with Engineers and Geoscientists British Columbia. Fede moved from Costa Rica to Canada in 2015, and since that time obtained his Master of Applied Science from the University of British Columbia and gained an excellent amount of experience in various areas of transportation engineering. He joined Bunt & Associates in 2017, and from day one Fede has displayed a high degree of professionalism and enthusiasm while contributing as a valuable team member on several large, high profile projects throughout the lower mainland.